A BUBBLING CAULDRON: DON'T BLINK! 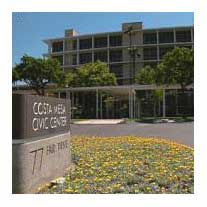 The Costa Mesa City Council meeting tomorrow night may set a record for brevity. There are no Public Hearings scheduled, no Old Business to be discussed and the only items on the New Business agenda are appointments to various city committees and, at the very tail end of the proceedings, a Master Plan Screening request for a proposed development in the 500 block of Victoria Street. Unless someone pulls something from the Consent Calendar for separate discussion - like item #12, which reduces pay and benefits for Deputy Fire Chiefs and Battalion Chiefs for the next year - it's possible that this meeting will wrap up well before 7 p.m. I've reviewed the staff report on that screening request. Looks to me as though this project will create an under-parked, over-populated ghetto on the Westside - precisely what the Urban Plan was supposed to preclude. In theory, this 44-unit common interest development will replace 28 apartment units, but the staff report indicates failures in the area of parking, compliance with Residential Design Guidelines and Municipal Codes regarding setbacks. We hope the elected leaders of this city will not, in a misguided attempt to prime the development pump in this economic downturn, permit this development to move forward without some serious re-calculations. If following our codes and design requirements keeps the project from penciling-out, so be it. The developers will just have to go back to the old drawing board and present a project that meets our guidelines. Maybe it's time for the City Council to revise their rules for the agenda at council meetings. Currently, no Public Hearings can begin before 7:00 p.m. I understand the rationale for that rule in the past, but times have changed. By following that rule it makes for herky-jerky meetings, with the council jumping ahead to New Business items if the witching hour has not yet arrived, then falling back in the agenda schedule for Public Hearings once the big hand on the clock passes 12. The council should revise their rules, follow the agenda as published and let those presenting issues to the council in the Public Hearings segment take the responsibility to be there on time.